I needed a quick book-fix after a relatively stressful day at work. At Gibert Joseph, I browsed through the English books section, picked up a couple of novels, and was heading back downstairs to the cashier to pay for my purchase. There, lo and behold, a book that’s promoting for all the “fat words” of the world. “Fat words”? 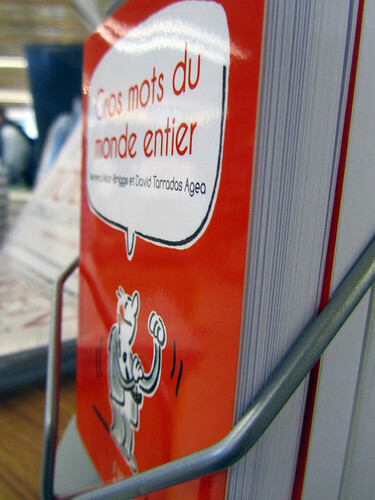 Actually, gros mots translates as swear words… aha, now, you’re probably thinking – interesting book! Especially one which promises a guide of 80 most commonly used, errr, colourful phrases. In 12 languages, no less. Of course, that means this book is now categorised as “dictionary” and I can think of a couple of people who wouldn’t mind having one on their bookshelves, hehehe. lol… that is very true! hmm i miss a good plate of nasi lemak.